is there a forgiving one! I love the style of the bladed putters like the JAT and phil mickelsons putter but is there one which has a sweetspot bigger then a pea? This is probably impossible because of the style. Maybe the new xg #9 is gonna be worth a try. My scotty cameron studio style newport 2.5 blade style that has a German Stainless Steel insert - anywhere on the GSS insert works for me - - if I am outside of the GSS then I made a really really bad swing. On the less expensive side - I have an old odyssesy DF550 blade putter that worked well for me. A hit anywhere on the large black insert seems to go well. Just two ideas for you. A good putting stroke does not really need a very forgiving blade. Personally, I would love a Scotty Cameron American Classic VII or a Circle T Napa finished in 3X Oil Can. If you like the XG #9, try a Bettinardi BB-16. Ping made a Sedona putter a couple of years ago that was quite forgiving for a rear-shafted putter. Odyssey also made a White Hot version of the 8802 that was pretty easy to hit well. The main difference is you have to "gate" a rear-shafted putter, which means opening the face on the backswing and closing it on the followthru. 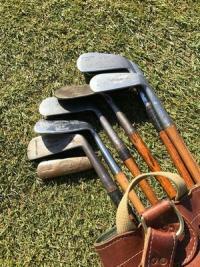 If like a straight-back and straight-thru putting stroke, stay with a Ping Anser or some center-shafted putter. I sometimes still putt with a '96 Ping Sedona. It was the best looking "8802" style putter I have found. Not as small as an 8802, but with great feel and some forgiveness. They are hard to find, but would be worth your time to check into one. I can't play blade putters. I have no lag putting capability with them. I feel like I have to smack the ball, not stroke it. The guerin Rife Aussie balde putter is pretty big and is forgicing. Give it a try. The Laguna 2.5 Studio Stainless comes to mind. Chunky bumpers. Just a thought.